If you live on this planet, the name David Hasselhoff probably causes the back of your throat to tingle with the acidic taste of partially regurgitated bile. It’s ok, we’ve all been there. Maybe this game will help get your stomach back in shape. 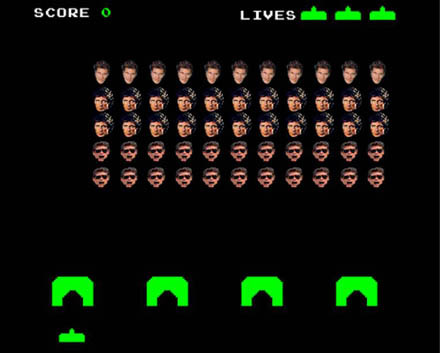 It’s a retake on good old classic Space Invaders, only the space mutants have been replaced by The Hoff’s head. Very satisfying. Play it here. Story VIA Productdose. Alguna mente retorcida ha creado esta versiÃ³n del clÃ¡sico “Space Invaders” susbtituyendo las naves alienÃ­genas por cabezas de David Hasselhoff.